From route 101 turn onto Warner Hill Rd. Warner Hill Rd is under severe construction and full of heavy equipment. I parked in an open field near the former railroad crossing at 1.1 miles. From parking cross the grassy field and follow the severely overgrown skidder road / 4x4 trail in a northeasterly direction. It ascends a moderate section then makes a very short descent. The grade becomes less steep but the trail becomes much more overgrown and packed full of raspberry bushes with extremely sharp thorns. To avoid the thorns as much as possible I bore left but encountered private property causing me to head back into the raspberries. My pace slowed to a crawl as I carefully navigated the thorns and headed straight upwards. The raspberries thinned as you hit a southern ridge and the true summit is a short distance away. There are no official markings at the summit however there is a celluar tower tree and access road at the highest point. There are no views from the summit. On descent I did my best to avoid the raspberries by skirting the left perimeter of the skidder road. It was much better than my ascent however still not ideal. 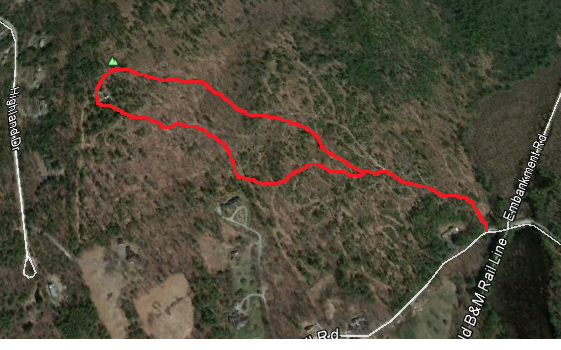 I didn't have my GPSr and was impressed with my internal compass and trail finding abilities. 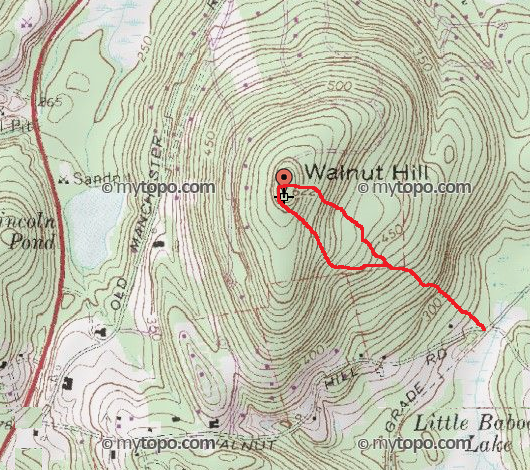 At 622 Ft. Walnut Hill is not a town highpoint however has a 300 Ft saddle making it the 36th most prominent peak in Hillsborough County and 647th most prominent peak in NH (but who is counting). My approximate route is above. The left split is my ascent and right split is my descent. The lower section of the 4x4 and former skidder road I followed.